Overcome the dull lackluster sound of Harley's OEM fairing speakers. Lower vented fairing speaker pods and speakers will project the sound in all the right places, bringing the tunes to life even at highway speeds. These 'pods' allow you to house an impressive 6.5" speaker. Easy to install in any '94 to Present lower vented fairing equiped Harley-Davidson touring model! 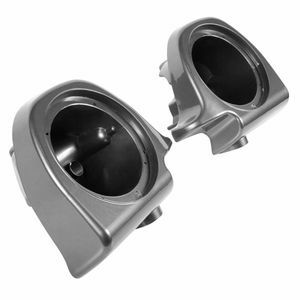 Add 6.5" Speakers to any Harley touring model with Lower Vented Fairings. Designed to work with any 6.5" speaker, that has a grill size of 171mm or smaller.